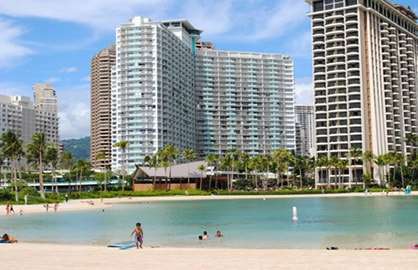 WaikikiBeachRentals.com - Best 2 Bedroom at the Ilikai - 2000sf+ 700sf Lanai !! In addition, this unit has a rare large laundry room that usually only penthouse units are approved to have with Miele machines. 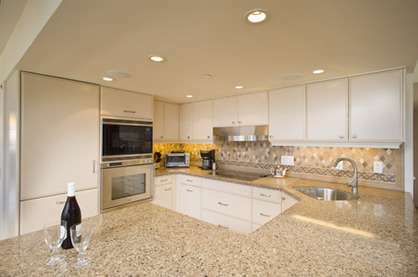 The granite gourmet kitchen is large, super modern with only the very best appliances to make any chef happy. Sub Zero Fridge and wine cooler, Wolf Microwave, Gaggenau oven and Miele dishwasher. 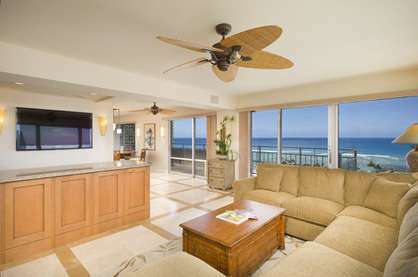 4 top of the line whisper quiet Mitsubishi split AC units keep the condo cool and the large lanais offer the best sun decks available while watching the surfers, sunset, fireworks show and all the beach and marina activities. 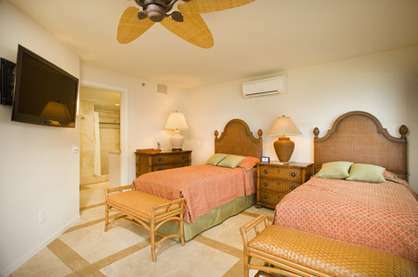 The master bedroom has a king bed, the 2 bedroom has two double and there is a queen size sofa bed. Don't delay, if you want the best unit, this is the one! See our all unit calendar to check. 325.00 30% to reserve dates. Remainder due 30 days before arrival. Ilikai 1543 - Wow. We stayed April 2018. What a great unit. Amazing views. Unit was huge in size for four of us and clean, comfortable beds and great kitchen. 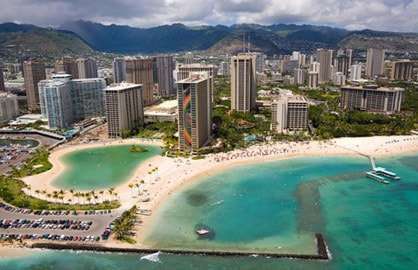 Great to deal with Waikiki beach rentals. We will definitely book this unit again. 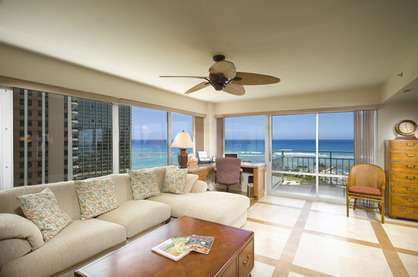 Ilikai 1543 - This condo is perfect for 2 couples. It is big and comfortable and has amazing views. It is 2 condos in one and works so well. I could live here. We stayed with our daughter, her husband and two toddlers. With the two living areas the kids could be playing in one and we could be in the other and still keep an eye on them. The area is so big we had a sit down Christmas dinner for 10 and a 6 foot tree. And they fit without moving any furniture. Perfect. We will be back. This condo was fabulous! Very spacious, and had more than enough room for our family of 5. The views of the water and sunset were breathtaking. The location was perfect in terms of the distance to the beach, the restaurants, the shopping. The condo was nicely stocked with dishes, coffee maker, other general appliances and kitchen necessities. Very clean. Absolutely lovely! We would definitely stay here again if we were to come back! 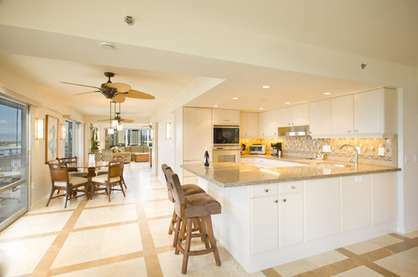 Ilikai 1543 - Fantastic holiday rental, best location and access to all amenities. Would recommend to anyone, we had 4 adults and 2 children and plenty of space to enjoy ourselves. Look forward to returning soon. Our stay in Ilikai 1543 was part of a longer Hawaiian vacation celebrating our 50th wedding anniversary. Our family came with us; a few dropped off after two weeks on the Big Island. Others came with us the Waikiki and then dropped off. We went on to Maui. We had not planned to stay at 1543. That was a hastily arranged (and as it turns out extremely fortunate opportunity). Our original reservation fell through as it was made through an agency who declared bankruptcy. Talk about panic mode just several weeks before departing for Hawaii. But there it was - 1543 - available for the period we needed. And it turned out to be everything advertised and more. Very close to everywhere we wanted to go; lagoon in our back yard; ocean beach just a few more steps away. And what a place to watch the Friday night fireworks!! 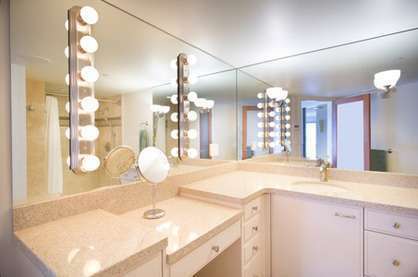 This condo was equipped with everything we could have asked for and very neatly accommodated our party. Highly recommended. 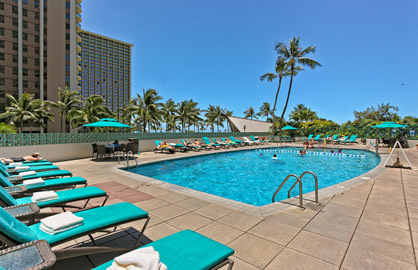 We have just left a 9 day trip to Waikiki and the best accommodations ever at the Ilikai 1543. 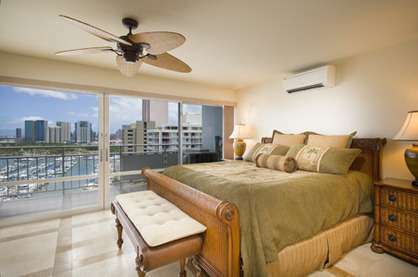 This extra-large renovated unit with spectacular lagoon, marina and ocean views was perfect for our family. The condo has quality furnishings, the kitchen is well-appointed with high-end appliances that made easy work to prepare meals. We appreciated the in-suite laundry, keypad entry system and late departure option. All three lanais were put to good use and fireworks in the eve were a highlight. Each evening the teens had one side of the condo to hang out together and we had the other seating area to relax, or we we could all be together very comfortably. When just hanging out at the condo, we put the TV on the Hawaiian music channel 800 - totally adds to the ambiance. Plenty of options if you choose to eat out, get groceries and souvenirs. There is a mini-mart in the hotel. The ABC chains are everywhere and 2 are within a block of the hotel. Foodland was over at the Ala Moana Mall and we picked up most essentials there; the cab ride from condo to mall was $7 approx. 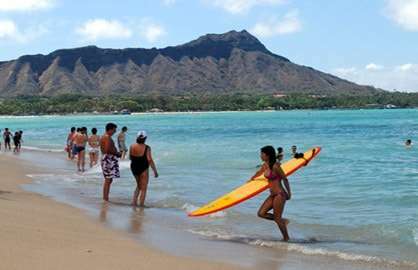 or you could use the bus or trolley for even cheaper cost.The Ilikai concierge was very helpful with recommending activities and assisting with tour bookings. 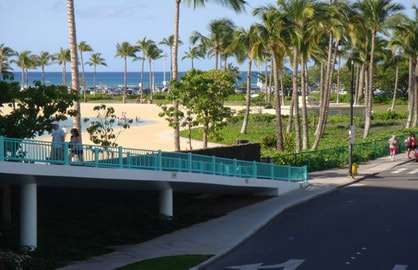 It was easy to get around - walking in Waikiki was enjoyable. 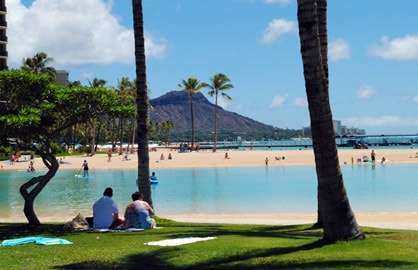 The Waikiki Trolley program is total worth looking in to and we definitely got good use/value with this service and covered a lot of ground with the trolley transport and tours provided. FYI book online in advance for savings. The drivers/tour guides are great - funny, informative and helpful. We rented a car for a day to tour the island and that rental service was conveniently located in the Ilikai Hotel - another book-ahead recommendation. Other than that, we used the trolleys or cabs with ease. It felt like we were at the quieter end of the Waikiki strip - we trolleyed into the shopping district/beach and noted the difference with crowds. A smart phone was such a help here - the Urbanspoon app was a helpful tool with locating restaurants in the area to try out, the map feature helped re-direct us when site-seeing and there is an app for the Waikiki Trolley program for ease of planning. 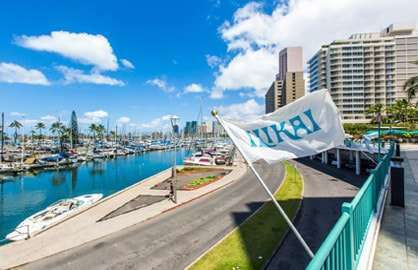 We were first-timers to Hawaii and our experience at the Ilikai left us happy to return to this unit and its magnificent ocean view! 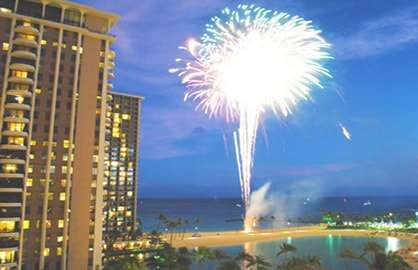 We just returned from 10 days on Oahu staying in Ilikai condo 1543. I can't say enough positive things about our experience. The condo has the best view in the area. It is clean, spacious and comfortably held 6 people. We appreciated the easy in and out with the keypad and no registration lines. What a pleasure to wake every morning and view the marina and then watch the sunset later in the day from the lanai. 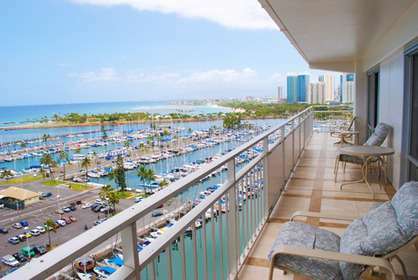 I recently stayed in Ilikai condo 1543 with my family. I would recommend this condo, it was excellent - it was fully equipped, all appliances and fittings were top quality. 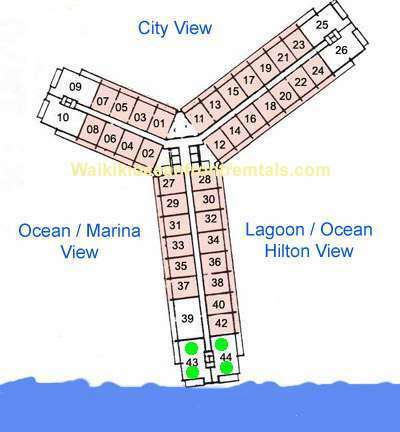 This unit is two front ocean view units joined together so you have both the lagoon view and marina view. You get the best vantage point to view the fireworks each Friday and Tuesday night. 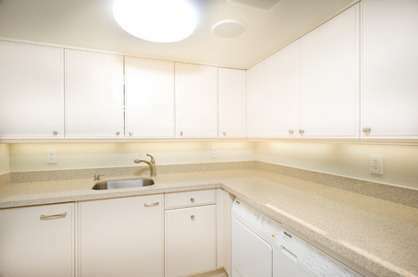 The unit is quiet and spacious, has air conditioners and fans in each living area. The unit has been renovated and is ultra modern and clean, you would be hard pressed to get anything better than this unit, it also has a laundry with miele washing machine and dryer. Arriving and departing is easy as there is a code lock access so there is no need to collect keys from anywhere. Early arrival or late departure can be organised if no one else has the condo booked. 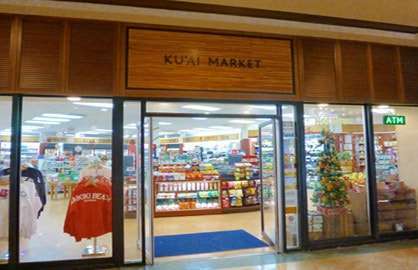 The Ilikai itself is in a great location, you do not need a car and can walk to the main shopping strip or to the fabulous Ala Moana shopping centre. 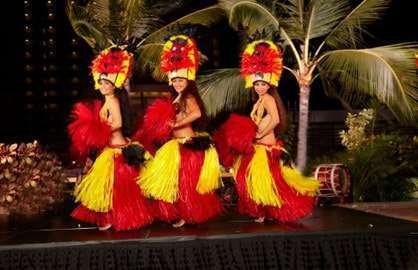 There is car hire available from the Ilikai if you want to tour the island or drive to the premium shopping outlet. You can also book tours from here. I will definitely be coming back here and wouldn't want to stay anywhere else. Unbelievable!. Just Fantastic!! More than we were expecting. On arrival we found the condo in great condition, clean and tidy, and everything in it to make our stay very comfortable. Plenty of space with generous bedrooms and living areas for 5 adults/kids. Easy to keep clean. 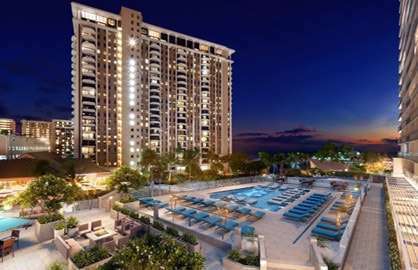 The three (3) balconies/lanai's offered spectacular views over the marina and ocean. 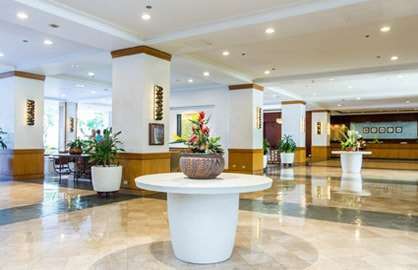 Everything was within walking distance - maximum 15 minutes to all restaurants, beaches and shopping. We stayed for 10 days...could have stayed forever. We'll be back. 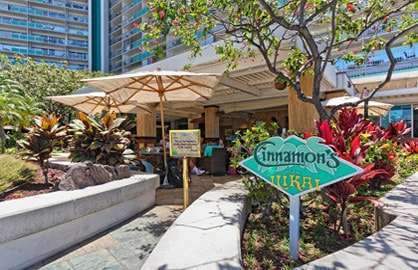 This accommodation at the Ilikai in Waikiki, was a fantastic place to stay. It was so spacious, equipped with everything you need, and had the most gorgeous views from the balconies. The location was great – close to everything. Beach, tours, shopping centre – it was all right here. We will definitely go back. Beautiful condo, beautiful view! 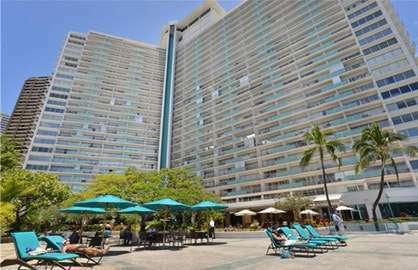 Several family members rented various condos at the Ilikai for a large family reunion in June. We rented #1543 because we wanted to have plenty of room for a central gathering point in the evenings. It was absolutely perfect. Everybody raved about the expansive view and the wonderful accommodations. We stayed 12 days and wished that we could have stayed a month. Thank you for a blessed stay, the unit was really great, I always say when we go on vacation we want to stay some place that is just as great as ours or even better, this unit was like at home for us, it had all the things we had at our house. It had a great view. The TV's were the best big screens, we stayed there for three weeks, it was just like what they had on line.We really enjoyed Honolulu, this was our second time coming here, the first was on a 15 day cruise, but this was even better. The weather was great,there was nothing I would change in this unit. easy to keep clean, everything he said on line was true, even the late check out. Yes we will come back here again, maybe stay longer. I recently stayed at the ilikai unit 1543 and it is spectacular. 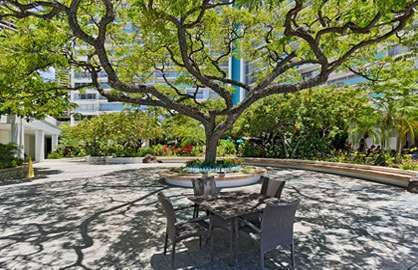 The unit has been completely refurbished, the fit and finish are very high end and the value for the dollar is unsurpassed.The space and views are great. Given the opportnity I would stay here again in a heartbeat.